Before I look at the Opinion in detail I’ll set out a few background issues – on the technical background of modchips for the lawyers, and their legal background for the technicians. For the last few videogame console generations there have been on-going skirmishes between the console manufacturers who use technical ‘locks’ in their console hardware and software to stop console owners running ‘unauthorised’ software. Unless each game disc or cartridge carries the correct encrypted key it will not run on the console. For the manufacturer this has two benefits; it means that pirate copies of their software will not function on standard hardware, and also that software publishers must get a licence, after paying an appropriate fee, to make their software available to the public. 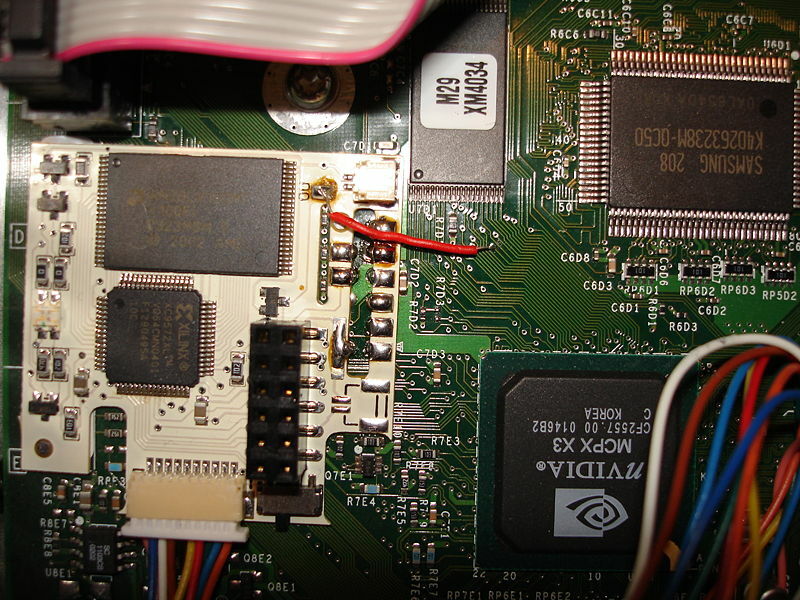 Modchips are pieces of hardware which effectively disable those ‘locks’ allowing pirated software, and legitimate, but unlicensed, ‘homebrew’ software to run on consoles. EU Law protects copyright holders efforts to protect their work through ‘technological protection measures’ (TPMs); such as these encrypted codes or other forms of DRM. All EU Member States are to give adequate legal protection against ‘circumvention of any effective technological measures’, by Art 6(1) of Directive 2001/29. Art 6(2) of the Directive requires MS to give legal protection against the manufacture or sale etc. of any device which (a) has the purpose of circumventing a TPM, (b) has a limited commercially significant purpose other than such, or (c) is primarily designed to do so. We don’t have time for a for a detailed examination of the issues with the Directive in this piece but you can read a lengthy comment on the UK’s implementation and case law which I wrote with David Booton in 2012. There is one interesting issue that I want to pull out from the Opinion before I go on to look at the substantive issues in Directive 2001/29 – the Copyright Directive. Videogames are obviously software and at first glance would therefore be governed by the Computer Program Directive (Directive 2009/24) which gives leeway for a user to alter or reverse engineer software. But videogames are not simply computer programs, they also contain significant amounts of other copyrighted material; literary, artistic or musical works. The AG was of the opinion, at , that in such ‘complex intellectual works’, where the material cannot be separated, the greater protection of the rightholder in the Copyright Directive should apply. Videogames contain an unusually large amount of other copyright work, but most software will have some artistic or literary content, even if only in the user interface. Could this mean that the greater rights for users in the Computer Program Directives are in reality only available for a small subset of computer programs? At the heart of the AG’s Opinion is the fact that the encryption lock used by consoles, and the modchips that circumvent those locks, cannot distinguish between pirated and legitimate software. The console blocks the operation of legitimate ‘homebrew’ code, and modchips allow infringing copies to run. The Directive attempts to set a boundary between these two obviously conflicting desires and the AG suggests how the domestic courts should approach the task. The arguments of the parties and the Commission are set out in para . Nintendo submits that the fact that a technological measure prevents or restricts acts which do not require authorisation is immaterial, provided that such an effect is only occasional or incidental to the main aim and effect of preventing or restricting acts which do require authorisation. PC Box, by contrast, stresses the principles of proportionality and interoperability set out in recitals 48 and 54, respectively, in the preamble to Directive 2001/29: technological measures which go beyond what is necessary to protect the copyright material itself or which exclude interoperability should therefore not benefit from protection. The Commission considers that, if such measures prevent also acts which do not require authorisation then, if they could have been designed so as to prevent only acts which require authorisation, they are disproportionate and do not qualify for protection; however, if it is unavoidable that they prevent also acts which do not require authorisation, they might not be disproportionate and might thus qualify for protection; the evaluation requires the current state of technology to be taken into account. The AG took the ‘middle path’ and sided with the Commission; it was necessary for the national court to determine, given the current state of technology, if they could restrict acts which require their authorisation, without preventing acts that do not require authorisation – ‘In other words, could Nintendo have protected its own or licensed games without preventing or restricting the use of its consoles to play ‘homebrew’ games?’  This exercise of a proportionality test will obviously not be an easy one, and will require a balancing of the competing interests the effectiveness of the protection, the nature of the restrictions on legitimate uses, and the relative costs of different solutions . The extent to which PC Box’s devices may in fact be used for purposes other than allowing infringement of exclusive rights will therefore be a factor to be taken into account when deciding not only whether those devices fall within Article 6(2) of Directive 2001/29 but also whether Nintendo’s technological measures meet the test of proportionality. If it can be established that they are used primarily for such other purposes (and whether such a proposition can be established is a matter for the national court), not only are they used in ways which do not infringe any of the exclusive rights guaranteed by Directive 2001/29, but there will be a strong indication that the technological measures are not proportionate. By contrast, if it can be established that the devices are used primarily in such a way as to infringe exclusive rights, that will be a strong indication that the measures are proportionate. Consequently, if it is possible, a quantitative assessment of the ultimate purposes for which the technological measures are circumvented by means of the devices will be relevant in determining both whether Nintendo’s technological measures qualify in general for legal protection and whether protection should be given against the marketing of PC Box’s devices. I would agree that it may be important in some cases (though less important in others) that the implementation of technological measures which protect exclusive rights should not interfere with users’ rights to carry out acts which require no authorisation. However, to the extent that the latter are not fundamental rights, the importance of protecting copyright and related rights must also be given due recognition. None the less, such qualitative criteria should be viewed in the light of the quantitative criteria already discussed, namely, the relative extent and frequency of uses which do and of those which do not infringe exclusive rights. This indicates the complexity of the potential balancing process, suggesting that if the device were to allow a user to further a ‘fundamental right’ that would give greater weight to their claim, as opposed to the legitimate claim for protection by the rightholder. Would, for instance, a Twitter client, which facilitates speech, carry more weight than a Media Player, which does not? The Opinion is an interesting one, although it is a shame that there are a number of questions raised in the literature that the AG did not have the opportunity to address in this reference; perhaps they will be dealt with more fully in Case C-458/13. As to the task set for the national courts – it looks to be a very challenging one. I doubt there has been much research on the ‘commercially significant’ use of modchips. One of the reasons for the lack of information is that the market has always operated in a legal grey area. The console manufacturers have, in actions such as this, used enforcement action to stifle the development of a more ‘legitimate’ market. To my knowledge there has only been one widely available retail product that might have been seen as a circumvention device; the Datel Freeloader, which allowed imported games to be played on the Nintendo Gamecube. It was notable that Nintendo chose not to use vigorous enforcement action against a bigger and better resourced undertaking like Datel. Given that the market is already very limited, and largely underground, will a small player like PC Box be able to produce good evidence of the real extent of legitimate use? It will be very interesting to see what information a national court can access to establish the nature of the market and how such devices are used, but given that the market has never had a chance to develop, because of the uncertainty over their legal status, could the console manufacturers have already won this battle? This entry was posted in Case Comments, Discussion and Debate and tagged Angus MacCulloch, Copyright, Technology by eutopialaw. Bookmark the permalink.